An Unmanned Underwater Vehicle (UUV) operating in close proximity to a larger underwater vehicle can experience significant hydrodynamic interaction, which may adversely affect the manoeuvrability of the former. Due to significant differences in size and speed, the UUV will be required to navigate through rapidly varying flow regimes, which can cause it to lose position and trajectory. This may result in mission failure and possible loss of vehicle. The present project investigates these effects through analytical and experimental work, with an aim to quantify the flow pattern and pressure distribution at varying longitudinal and lateral separations between the vehicles and at varying speeds. The work consists of modelling the behaviour of the UUV in close proximity to a larger body using Computational Fluid Dynamics (CFD) in order to understand the interaction between the two bodies under different configurations. The CFD results are validated and supplemented by experimental work in the Australian Maritime College (AMC) Towing Tank, with the use of a Horizontal Planar Motion Mechanism (HPMM) as a support mechanism to measure the resulting forces and moments. 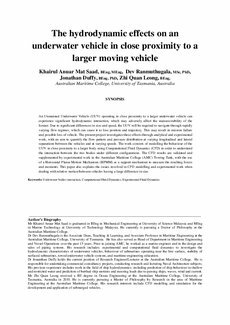 This paper also explains the issues involved in CFD modelling and experimental work when dealing with relative motion between vehicles having a large difference in size.